AudioGames is an interactive sound-game installation that allows users to experience in a three-dimensional sound space in a playful way. The playground is populated by virtual objects that become sound objects in the game space. These objects are intangible and invisible, but in the virtual world they have a specific mass and weight and their own physical behavior. When the player collides with them, they move and bounce around the game space, generating a real-time sound composition. User’s position in the space is detected by custom-made tracking software, creating an interaction between virtual and real world. We developed audio software that generates sound for the 3D world in real-time depending on the user’s position and movements on the playground. 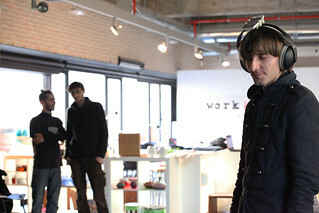 The user, who may be blind, moves around a virtual sound space (4×4 m2) interacting in real-time with a 3D augmented soundscape. Meanwhile the public can see the user’s interaction in real space and have access to a 3D visualization of the interaction with the sound space through a video played on a screen outside the user’s vision. We took Pacman’s game play as a basis to set up the basic rules of the first game. Audiogames finds inspiration in synaesthesia studies, elaborating new ways to investigate personal and collective relationships between sound and vision. Synaesthesia effect is mainly focused on the spectator who will somehow transcode the game’s visualization into meaningful sound. Through this project we experiment with other non sight-oriented technological interfaces, trying to build a common game space where both blind and sighted people can play together. We believe this is an interesting field of experimentation that can lead to a new relationship with space and technology through sound. Global installation’s area is about 10x5m. Playing area 5×5.6m hexagonal surface. Tracking software is made using Pure Data and two kinects on the floor. Tracking data is sent to blender game engine through OpenSoundControl and used to move the player’s avatar in the virtual world. Player’s orientation is attained by using OSC software for android 2.3 and sent to game engine using a wireless network. Physical parameters calculations and object positions are sent to a Pure Data program for sound spatialization. Final audio output is sent to wireless headphones using radio frequencies. Final video output is projected into the screen. AudioGames starts as one of the selected projects of PlayLab, an experimental videogame’s creation workshop, organized by ARSGAMES and MediaLab-Prado, with the support of Playstation, during January and February 2010 in Madrid. The first prototype we worked out during Playlab was an interactive sound space developed by Euridice Cabañes Martinez, Luca Carrubba, Oscar Martin, Carlos Padial and Jaume Castells. The same year the first prototype of AudioGames scores a Special Mention in the grants for digital creation section of Telenoika 2010. Audiogames is now a R&D project of ARSGAMES coordinated by Eurídice Cabañes, Luca Carrubba and Carlos Padial. Has been selected among a total of 367 projects from 22 countries to be showed during the IN-SONORA festival. Artist residency at LABoral Art and Industrial Creation Center where we are collaborating with ONCE 2Asturias in order to improve the installation. Has been one of the selected projects in the Stress Test call for project proposals organized by Espacio Trapezio. From this beginning as an interactive installation, the project is now being developed as a platform/framework for video games experimentation focused on sound. 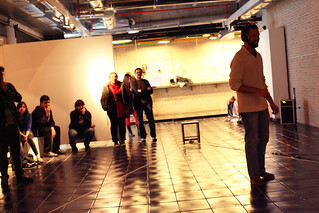 We want to organize different workshops about videogames in which sound interaction is prominent.